Acaptivating ice angling trend is afoot. Folks who?ve never steppedonto frozen water have suddenly, literally become transfixed by thesport. Even grizzled veterans of countless on-ice campaigns have beensmitten by the technological advances. Fishing through holes in the ice is nice, they say. Butnever was ice fishing more fun or compelling than it?s been since wefirst glimpsed below the surface with a MarCum underwater camera. This amazing device has unleashed a whole new world of angling discovery. I once was blind, but now I see . . .Atthe heart of this eye-opening development are two essential MarCumTechnologies underwater viewing systems?the economical new vs385c and vs385.Each built on high-resolution flatscreen LCDs, these efficientunderwater camera systems have at once made underwater viewing easierand more affordable for ice fishing?s growing ranks. ?Crazy cool stuff,? declares Ice Force pro and camera champion TonyBoshold. 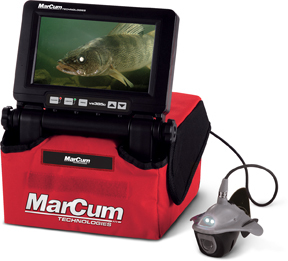 ?People who?ve ice fished for years are suddenly buzzing withexcitement because of these new MarCum cameras. It?s like they?rewatching their bobber go down for the first time. Spying on theunderwater world; doing things like viewing fish bite your lureunderwater?that?s electrifying stuff, man. ?Painting rich underwater landscapes in vivid color (vs385c) orblack-and-white (vs385), this dynamic camera duo relies on waterproof7-inch widescreens with a sharp 800 x 480 pixel resolution. Eachviewing system employs premium Sony optics (vs385c - Sony Super HAD IICCD; vs385 ? Sony Super HAD CCD) with 75-feet of cable and built inDarkwater® LED Lighting Technology. The vs385c also features aswitchable Color/B&W display for maximizing viewing clarity underall conditions. Never before haveso many radical viewing system features been packed into suchcompetitively priced packages. Like their tricked-out sister systems,both the MarCum vs385c and vs385 come sheathed in a protective customsoft-pack. Completing these ?fish ready? units is a 12-volt 7-amprechargeable battery, 3-stage auto battery charger and a cameraDown-View/Stabilizer Fin.Underwater cameras have become standard equipment. MarCumTechnologies ensures that quality and performance will remain standardissue, too.